Safety Pin-On Plastic Badge Holder Straps - On Special Sale Now! 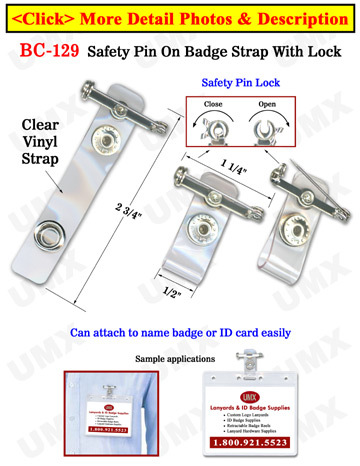 Material: Clear Vinyl Plastic Badge Holder Straps with Safety Lock Pins and Snap Buttons . The safety pin-on plastic badge holder straps come with metal safety pin locks. You can put the metal pin on dresses or pockets with safety lock protection. The snap buttons on the plastic badge straps are very easy to snap-on or off your name badges or name tag holders. It is great for general purpose, business, school, military, trade show, promotion, concert, sports or meeting name badge clips or name tag clips with low budget.